You should sell this one to the boy scouts. Nice! This is great!!! 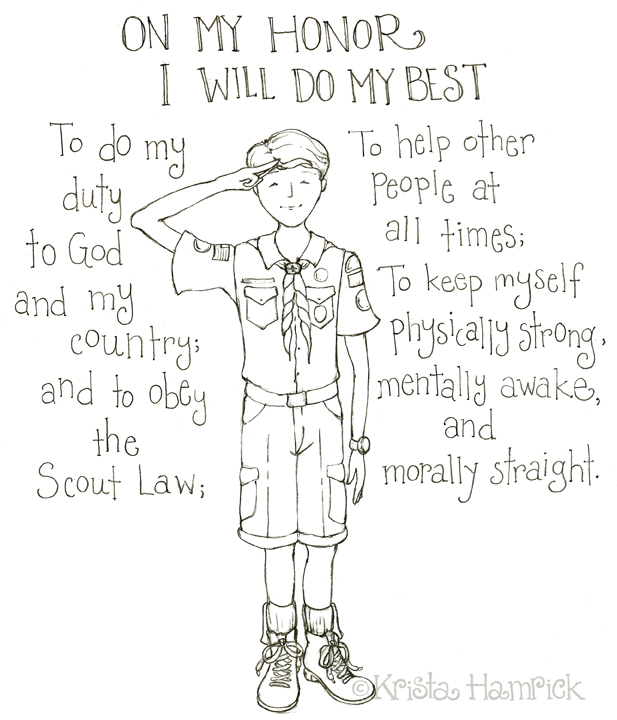 I love this especially since I AM STILL A GIRL SCOUT! YES! And I am very proud to be a Girl Scout. I had my own troop – a lot of work! Yes! Haha! Nicely done! You should show this to the Boys Scouts organization! Awesome idea Krista. My husband was an eagle scout and later a scout leader. I think it broke his heart when my son didn’t want to be a boy scout too. Just wonderful Krista. A slant I had not thought of. Yes, NR would be very proud. Wonderful! I’m sure Mr. Rockwell would be very honored. You know, the first art coffee table book I ever bought was of Norman Rockwell. He is timeless. Krista, I salute you! This is a great interpretation, Krista. I thought of Rockwell before I even read your caption.